These taste like the real thing, but better. 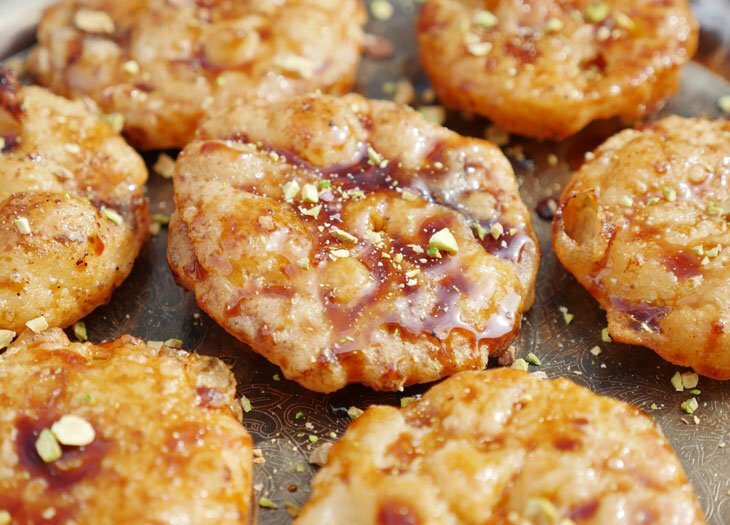 Think of them as fried apple donuts smothered in a sweet cardamom spiced sugar syrup. Traditionally, yogurt is used as a leavening agent when making this dessert, however by fermenting the batter instead, you’ll end up with a crust that’s just as nice and bubbly when deep-fried in hot oil. To make the Jalebi batter, combine almond flour, arrowroot, and coconut milk together in a bowl. Empty the contents of the probiotic capsules into the bowl and mix well. Loosely cover the bowl with a lid and put it in an oven with the oven light on for at least 10 hours. The oven should not be on, just the oven light. Once the batter has fermented, add ¼ cup water to the bowl and mix well. Heat oil in a wok or a deep, wide bottomed pot to 360°F or until a small drop of the batter sizzles and floats to the top. While the oil is heating, add ¼ cup arrowroot flour to a plate, dip the apple slices on both sides. Dip the apple into the fermented batter, then place into the hot oil until both sides are light golden brown. Cook 2-3 apple slices at a time. Then set aside on a paper-towel lined plate. Dip into cooled syrup, garnish with crushed pistachios and serve. Add coconut sugar, water and cardamom to a small saucepan over medium heat. Cook for 3 minutes, stirring frequently. Remove the sauce from heat, allow to cool. Depending on the brand of priobiotics you use, the number of capsules may vary. Look at the back of the box to see the number of cultures are in one capsule. If you use this brand, you’ll want to use two capsules since each capsule has 25 billion cultures. With other brands, you may need to use four or five in order to reach 40-50 billion. This is super easy to find at your local drugstore (CVS carries them!) but you can buy them on amazon as well.